Oh, the things you can make with a single sheet pan! 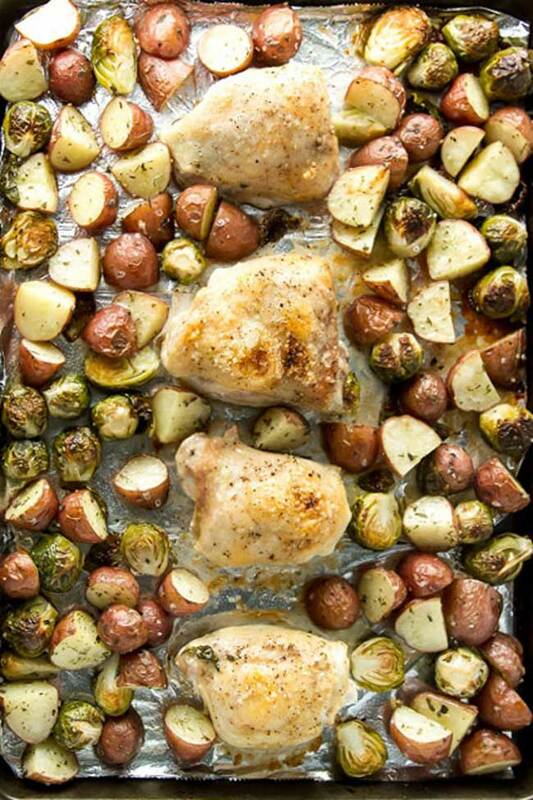 Sheet pan dinners are one of the easiest ways to get dinner on the table without leaving a pile of dishes in the sink. I’ve gathered up 20 different options and there’s a little bit of everything – chicken dinners, one-pan steak dinners, sheet pans filled with sausage and pork, a few seafood options and even one with crispy tofu. 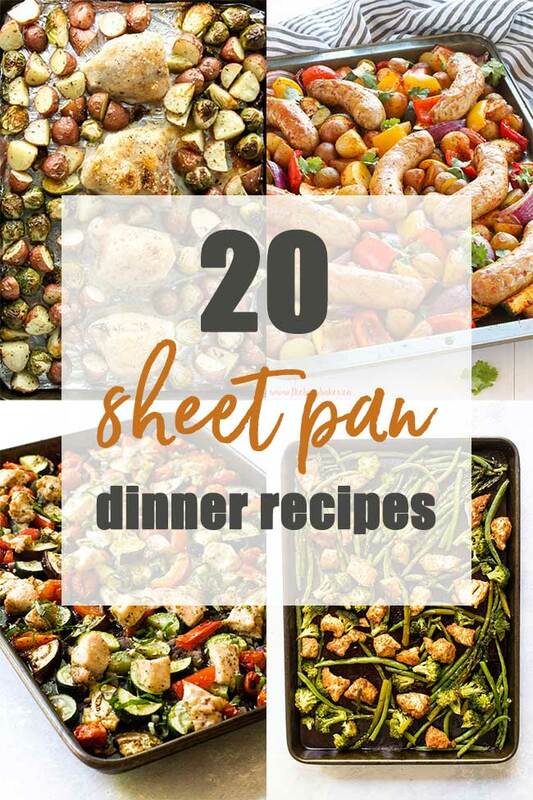 I hope you find some new sheet pan recipes to try! 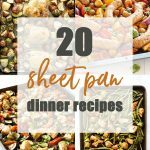 Click on the recipe titles or photos to get more details about these amazing sheet pan dinners! 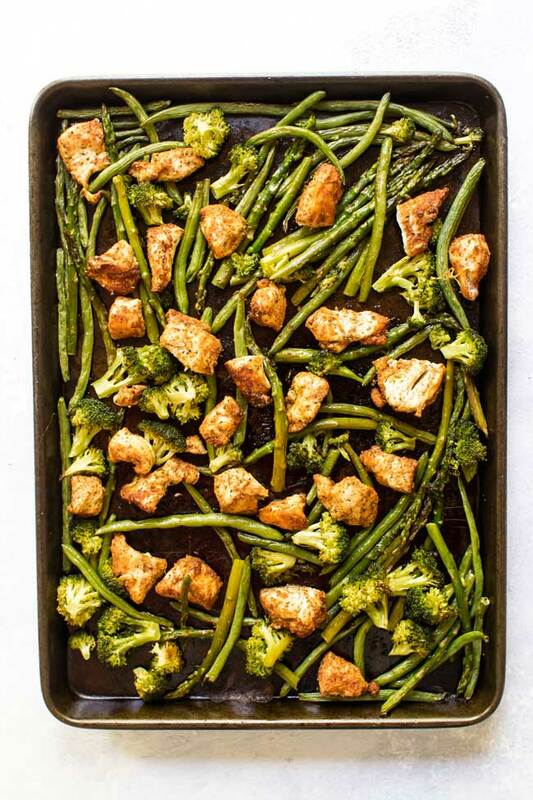 SHEET PAN CHICKEN WITH BASIL-GARLIC VEGGIES – Girl Gone Gourmet | Fresh green beans, broccoli, and asparagus cooked on a sheet pan along with chicken bites spiced with smoked paprika and few other seasonings. Drizzle it all with a simple basil-garlic dressing and you get a veggie-packed dinner you’ll want to make again and again. ITALIAN SAUSAGE SHEET PAN DINNER – The Busy Baker | More veggies! 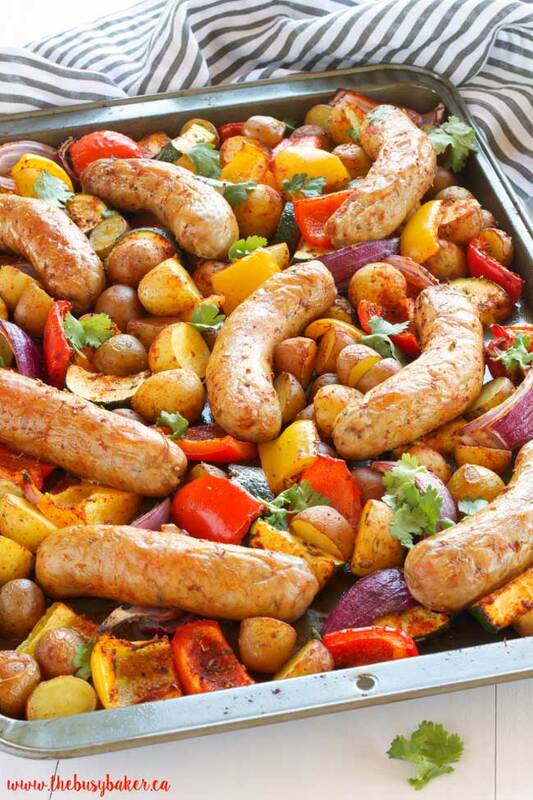 But this time bell peppers, red onions, and potatoes are tossed on a sheet pan along with whole sausages for an Italian-inspired dinner that takes 30 minutes start to finish. 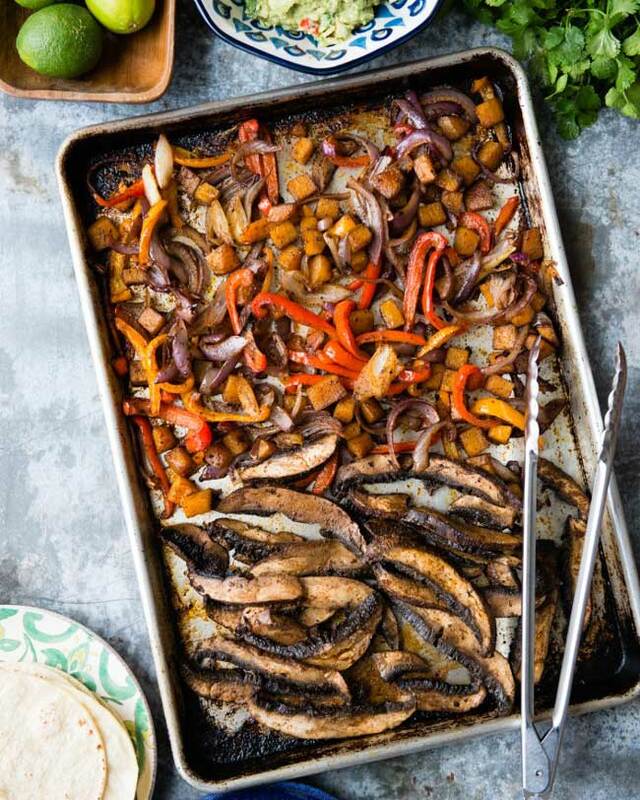 VEGGIE SHEET PAN FAJITAS – Hello Veggie | Mushrooms take the place of meat for these veggie fajitas and they cook right alongside the other veggies until they’re caramelized and tender. Serve it all up with tortillas and the cumin-lime crema(!) or make some fajita bowls or lettuce wraps to switch things up. 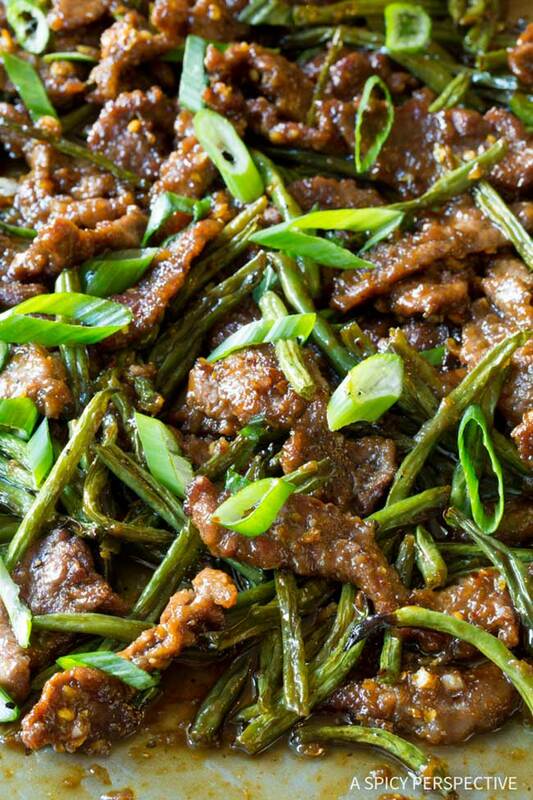 SHEET PAN MONGOLIAN BEEF – A Spicy Perspective | I love a great take-out inspired dinner and this sheet pan Mongolian beef has all the great flavor of the traditional dish without having to stand over a hot pan. Your oven does all the work and clean-up is so much easier. If you need a little more convincing click through and check out the reader comments on this recipe – Sommer’s readers love it! 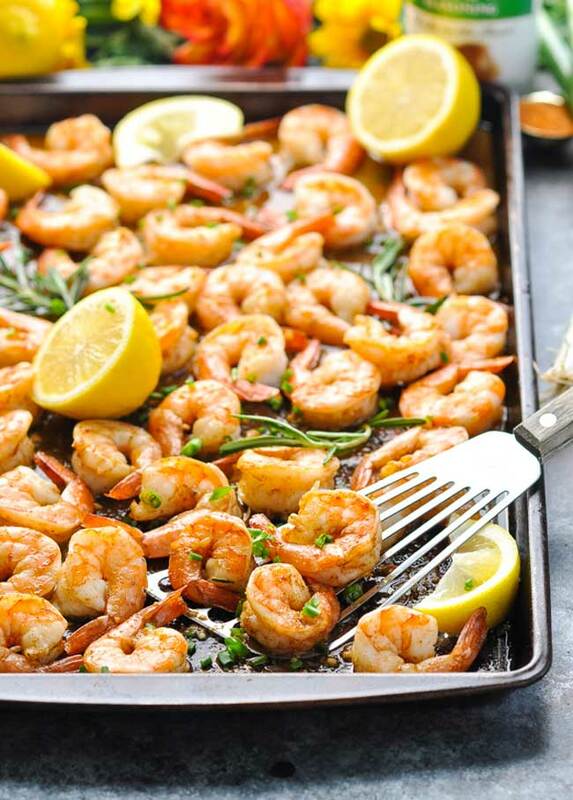 SHEET PAN BARBECUE SHRIMP – The Seasoned Mom | I love Blair’s blog because she has so many easy recipes and this barbecue shrimp recipe is no exception. It takes about 20 minutes, uses simple ingredients and looks delicious. 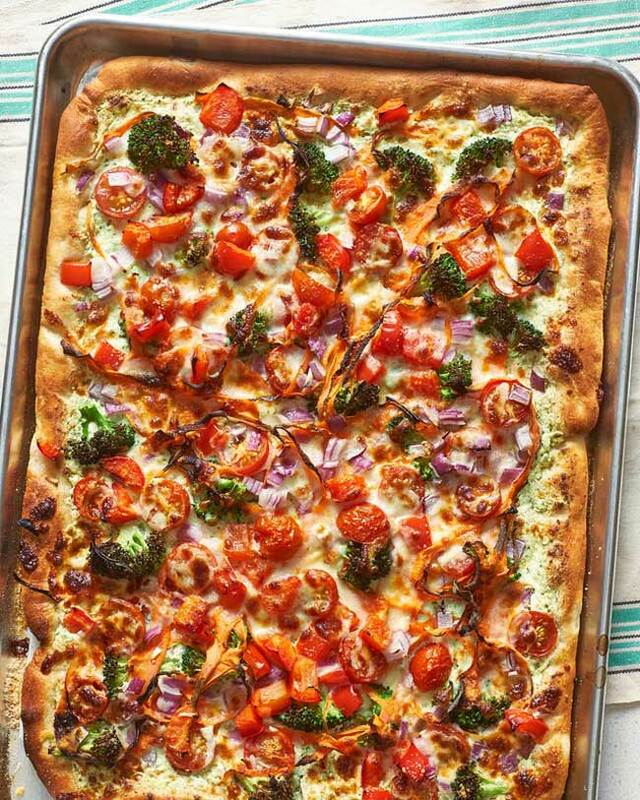 VEGGIE SUPREME PIZZA – The Kitchn | You don’t need a pizza oven, pizza stone, or peel to make a crave-worthy pizza. A ball of store-bought pizza dough, your favorite toppings, and a sheet pan are all you need! SHEET PAN CRISPY CHEDDAR PORK CHOPS – The Recipe Critic | Pork chops can be pretty boring, so I love how Alyssa breaded hers with crispy panko and cheddar cheese – so much flavor! 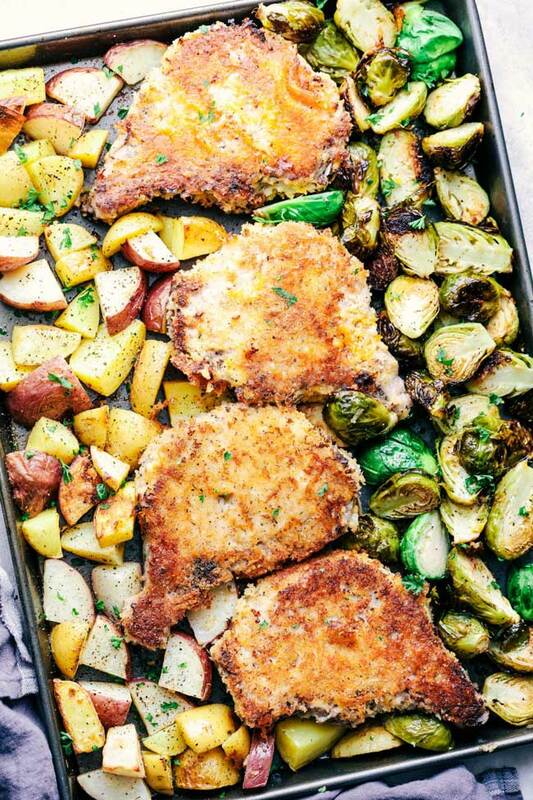 Add some brussels sprouts and potatoes for a complete one-pan dinner. 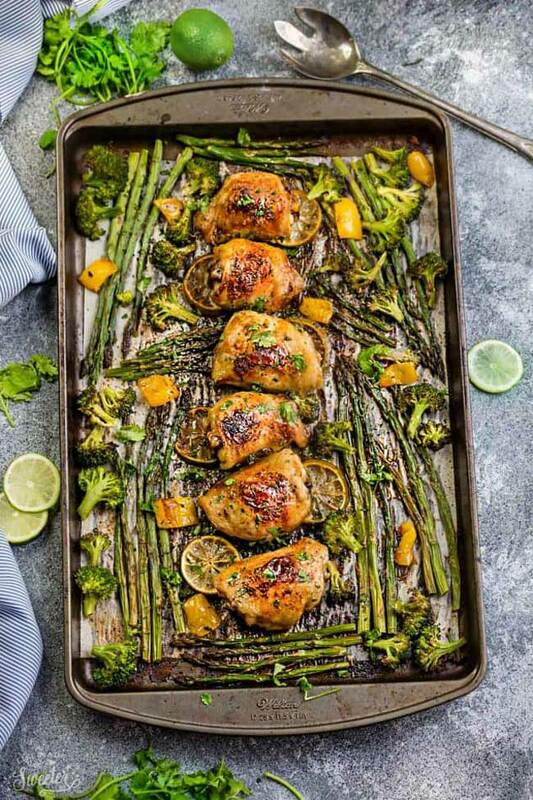 HONEY-LIME CHICKEN SHEET PAN DINNER – Life Made Sweeter | Chicken thighs have so much flavor and I love the honey-lime sauce that pulls this whole dinner together. Check out the post for tips on how to prep this dinner ahead for busy weeknights. 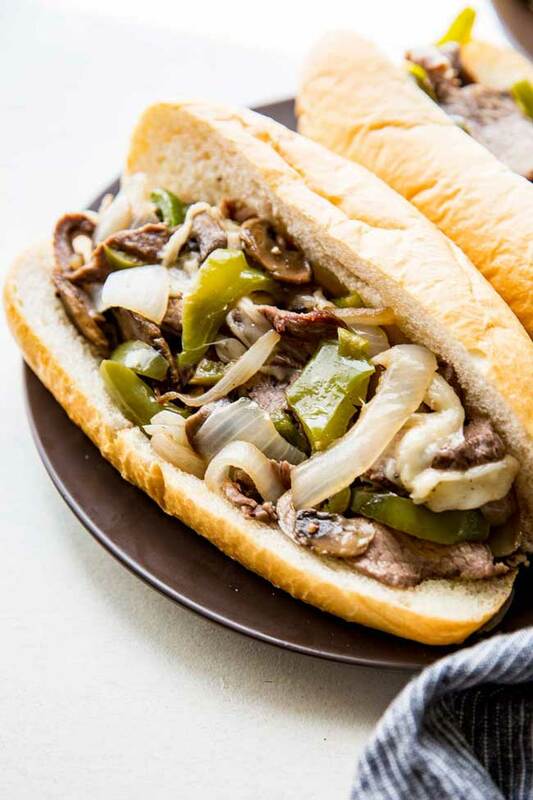 SHEET PAN PHILLY CHEESESTEAK – Eazy Peazy Mealz | Tender flank steak with peppers, onions, and provolone cheese cooked on a sheet pan and then piled into toasted rolls. A classic Philly cheesesteak gets a sheet pan upgrade making it an easy weeknight dinner. 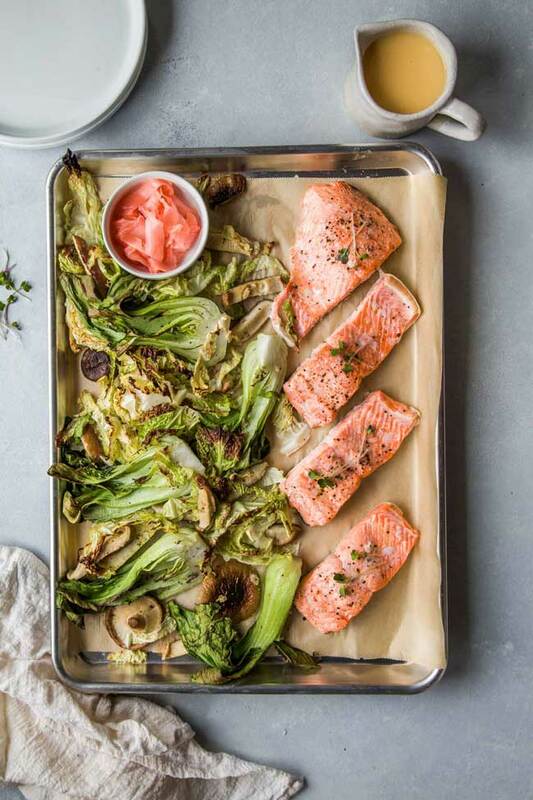 SHEET PAN SALMON WITH PICKLED GINGER BUTTER SAUCE – Platings and Pairings | This Asian-inspired sheet pan dinner is a way to seriously upgrade your sheet pan recipe game. It’s easy enough for a weeknight (only 30 minutes!) and fancy enough for guests – or think of this way: it’s a go-to dinner that looks way more complicated than it actually is. SHEET PAN GREEN CHILE BEEF NACHOS – How Sweet Eats | Do nachos count as dinner? 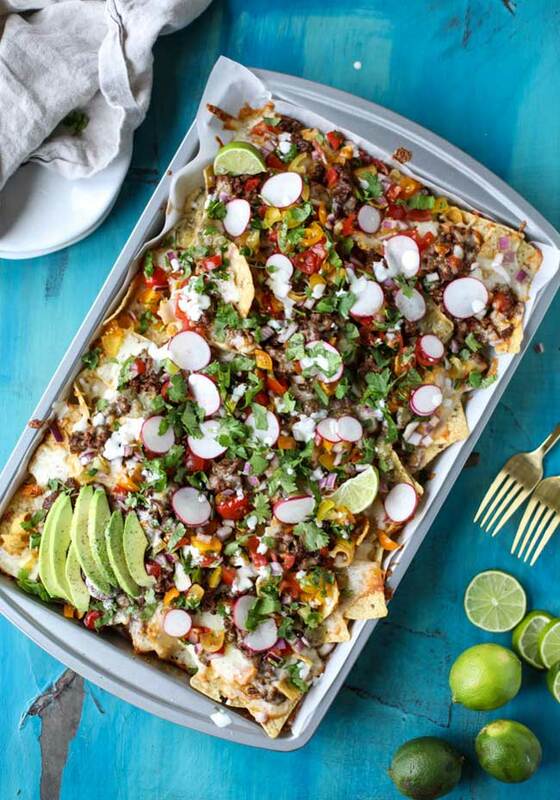 In my house they do, but only on very special occasions like random Fridays and these sheet pan nachos are loaded with all the things to make for an amazing Friday night. There’s savory beef, salty chips, crisp sliced radishes, diced green chile, melted cheese, and some Fritos (<– yes, Fritos!) thrown in for good measure. Click through to learn why – they’re not there on accident. 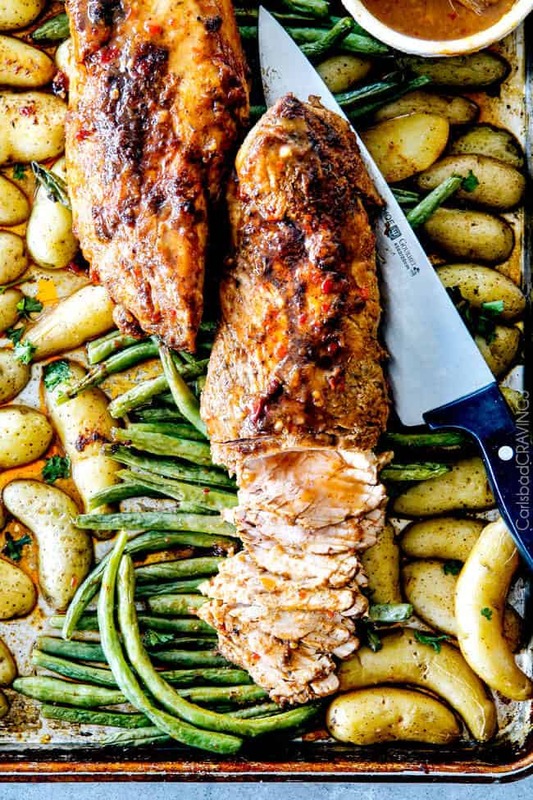 CHILI-DIJON PORK TENDERLOIN – Carlsbad Cravings | Fingerling potatoes, fresh green beans and a chili-Dijon glazed pork loin all baked up on a sheet pan for a Sunday-supper worthy dinner that is sure to please everyone gathered around your table. 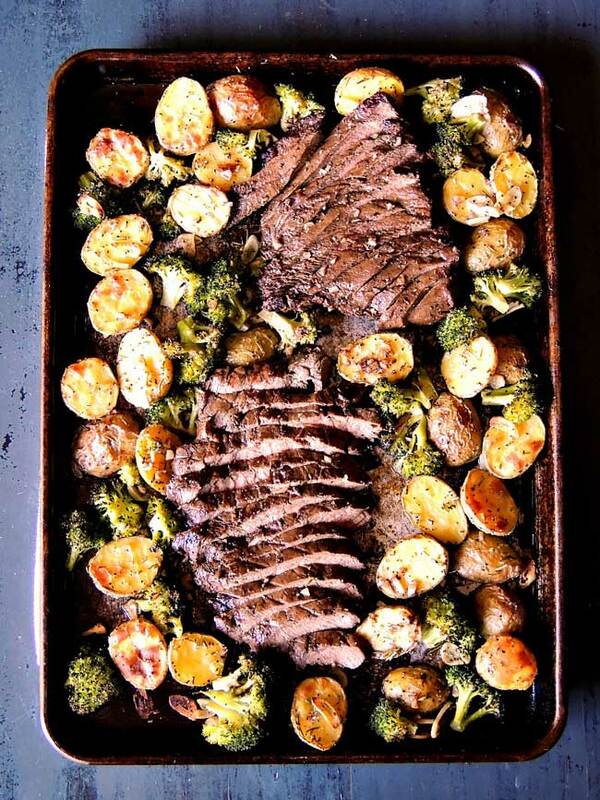 This sheet pan dinner is a bit more involved, but the results look amazing and judging from the reader comments I think the effort is well worth the results. SHEET PAN CHICKEN RATATOUILLE – Girl Gone Gourmet | A French classic with modern practicality. 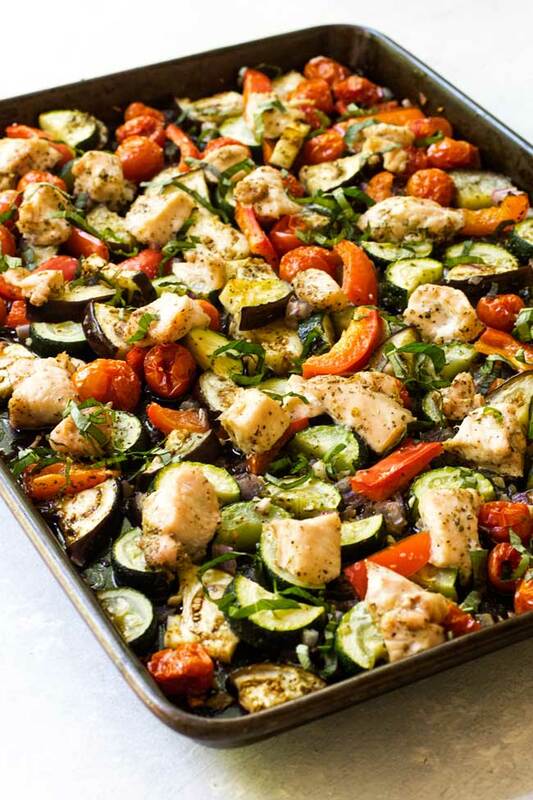 During the summer months, this sheet pan ratatouille puts all the wonderful produce like eggplant, zucchini, bell peppers, and fresh herbs to great use. The seasoned chicken makes it dinner and it really is a chop, toss, and bake recipe full of fresh flavors. 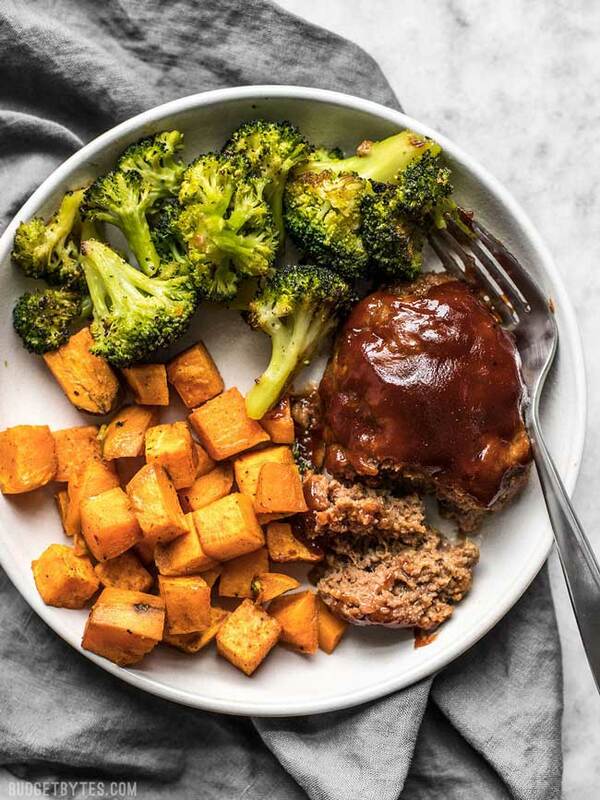 SHEET PAN BBQ MEATLOAF DINNER – Budget Bytes | Beth is the queen of budget-friendly recipes that don’t make you feel like you’re on a budget and this meatloaf dinner is no exception. She’s taken an old-school favorite and paired it with veggies for a sheet pan dinner that’s easy to make and even easier to clean-up. SHEET PAN BBQ CHICKEN DINNER – Number 2 Pencil | For those of us without outdoor grills this BBQ chicken dinner is a sheet-pan-style dinner that borrows the best of outside summer cooking. 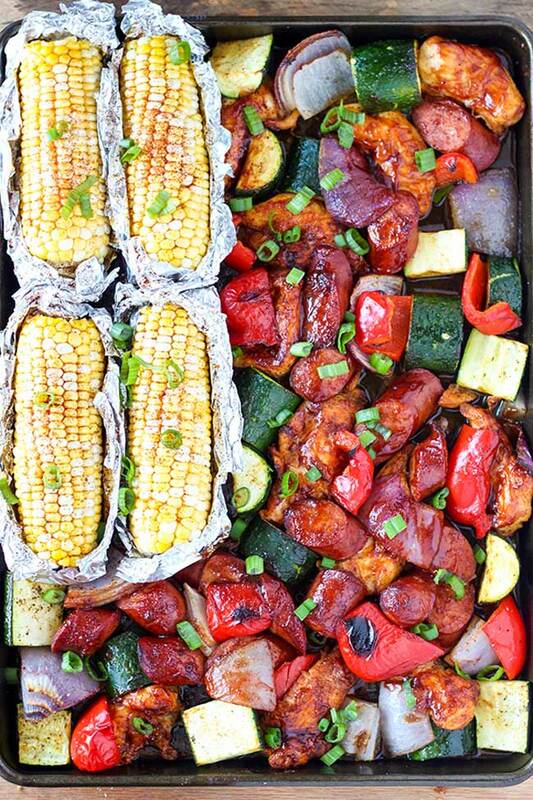 There’s fresh corn, caramelized peppers, and plenty of zucchini along with tender and juicy chicken with a BBQ glaze and it all cooks up together on a single sheet pan. SHEET PAN STEAK WITH POTATOES – Bobbi’s Kozy Kitchen | Calling all meat and potatoes fans! 9 ingredients, one sheet pan, and a big appetite are all you need to get this hearty dinner on the table. 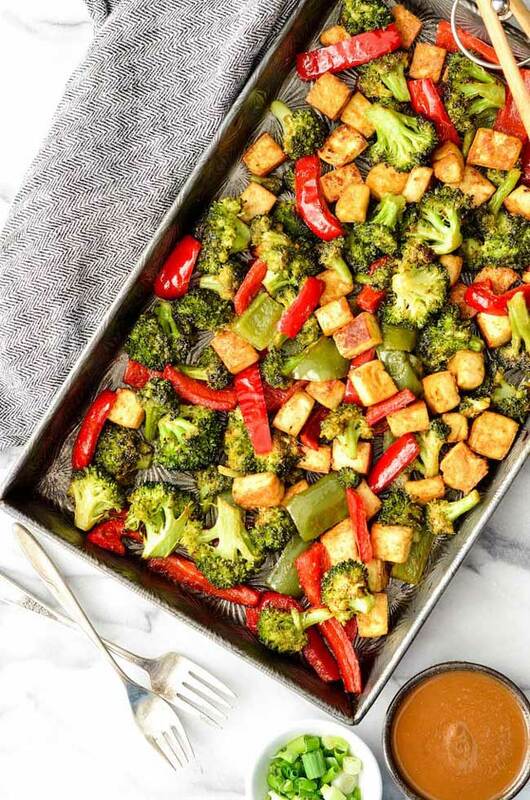 SHEET PAN CRISPY TOFU WITH PEANUT SAUCE – Joy Food Sunshine | I have to admit that tofu is not a common ingredient in my kitchen, but when I saw this crispy tofu sheet pan dinner I took a second look. It’s light on calories but big on flavor thanks to the savory peanut sauce. And the tofu looks so crispy – click through to learn the secrets in how to make it and add this one to your easy dinner rotation. 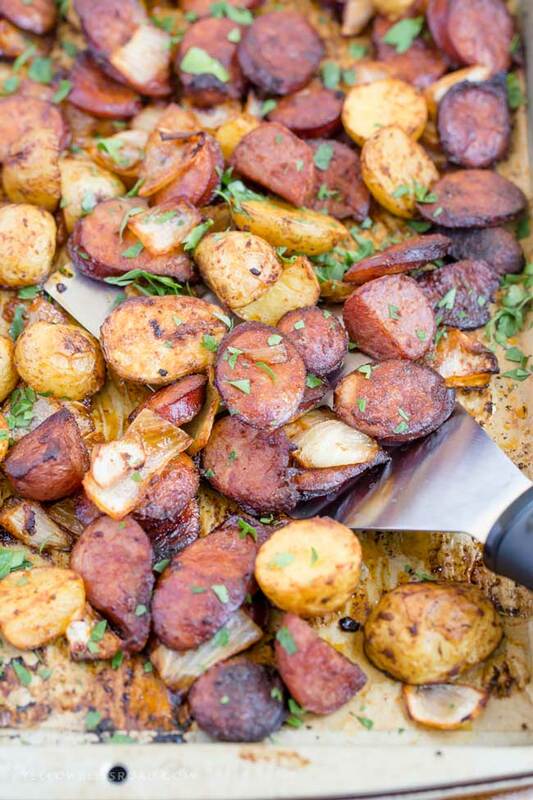 SMOKED SAUSAGE SHEET PAN DINNER – Yellow Bliss Road | More potatoes, but this time with savory smoked sausage. Enjoy it as is or add your favorite veggies (Kristen shares all of her favorites in the post!) to switch things up. Either way, this one’s a keeper. SHEET PAN LOW COUNTRY BOIL – A Spicy Perspective | Everything you’d get in a traditional low country boil, but cooked on a sheet pan. 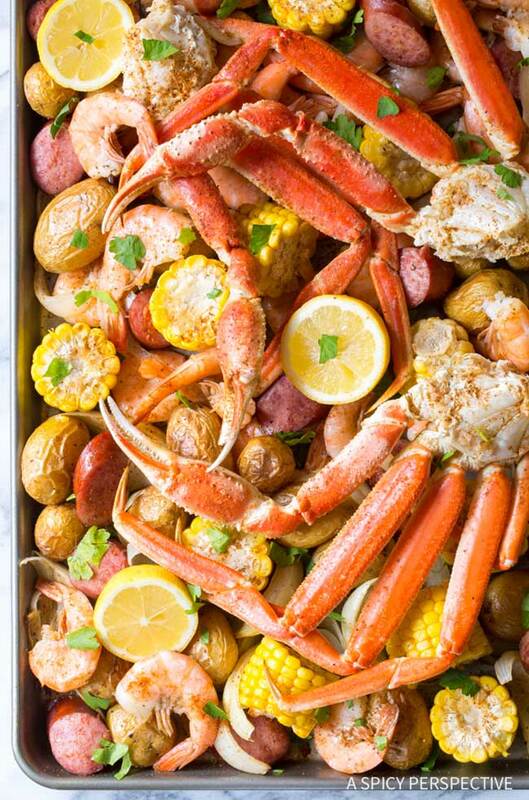 Shrimp, crab legs, summer corn, sausage, and potatoes – it’s all there along with plenty of fresh lemons and Old Bay seasoning. It’s a twist on an old Southern favorite that you’ll want to make all summer long. ROASTED CHICKEN AND VEGGIES – Girl Gone Gourmet | Tender and juicy chicken thighs with crispy skin along with new potatoes and caramelized brussels sprouts. It’s an easy take on a traditional roast chicken dinner that’s perfect for Sunday dinners and easy enough for a weeknight. Awesome roundup! Thanks so much for including my shrimp!